Happy Tax Day! If you have been busy this morning writing out checks to Uncle Sam or grumbling that your refund isn’t as high as you thought it would be, don’t worry about missing a whole lot in the market as things have been pretty quiet so far. The only economic indicator of note today is Empire Manufacturing, and the pace of earnings doesn’t start to pick up until tomorrow. Whether it was a kitchen sink quarter or not, last Friday’s earnings report from Wells Fargo (WFC) wasn’t received well by the street. After falling more than 2.5% on Friday, analysts had an entire weekend to think about and go over the results, and based on this morning’s research news, they didn’t like what they saw. 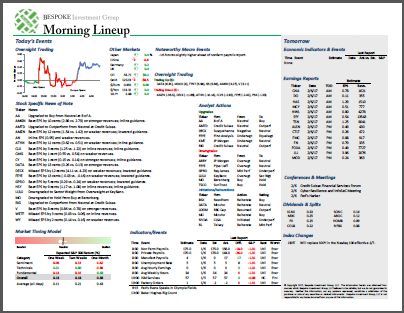 As shown in the analyst upgrades and downgrades section of our Morning Lineup, Wells Fargo was downgraded this morning by no less than four different firms. Not exactly a ringing endorsement, but one could also make the argument that sentiment towards the stock has become skewed to the negative side.